The limitations between UPS or FedEx Small packages and UPS LTL Freight are specified there as well. The shipping calculator will automatically switch from small package call for freight charges. PLEASE DO NOT MIX SMALL ITEMS WITH LARGE ITEMS. PLEASE SUBMIT ALL SMALL ITEMS AS A GROUP IN A SEPARATE ORDER AND ALL LARGE ITEMS AS A GROUP IN A SEPARATE ORDER. THIS WILL ASSURE THE LOWEST SHIPPING CHARGES. 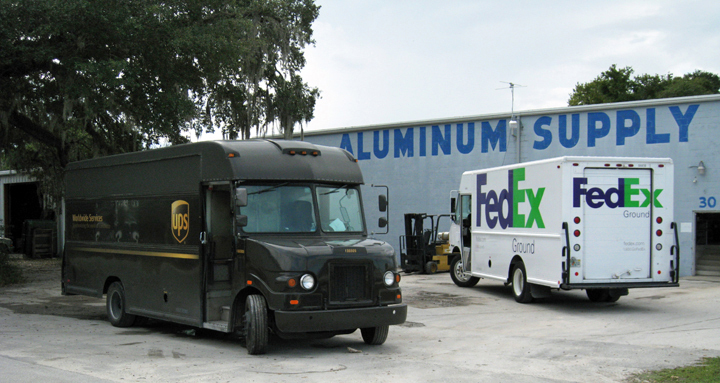 MIXING SMALL ITEMS WITH LARGE ITEMS WILL SWITCH EVERYTHING TO Call for UPS LTL Freight charges. IF THERE ARE ANY LARGE ITEMS THAT MUST BE SHIPPED BY UPS LTL FREIGHT, ALL ITEMS in the cart will be shipped and charged at the UPS LTL Freight rates which are much higher than FedEx or UPS Ground for small packages. Our return policy will be as follows: We will only allow the return of cut to size metals if the order was cut incorrectly. All cut to size pieces that are cut to order correctly will not be returnable. Should there be a piece or pieces that are cut incorrectly we will allow those to be returned for replacement for 15 days after the shipment left our warehouse. Should you need to return an incorrectly cut order please call our toll free number (877) 849-6595 to speak to customer service. We will pay for the return freight as well as the freight on the replacement order. You may also contact us by emailing info@myaluminumsupply.com.